The wind was from the northwest. The sun was thin and the air was brisk as we got coffee and a corn muffin and began our tour around the cape. It looked good south and it looked marginal north. The tide was going out, so it would be a clean exit to the ocean without having to have the Blynman Bridge raised for us. We decided to look up along the Back Shore for a likely place to make our first dive. Our crew of Kathy Cardinale, Pat Walsh and Peter Donahue was joined by Laurent Dubois, Larry Finer, Jacki Kronenberg, John Buhlman, and Jerry Comeau for the day. We were looking for lobsters and sight-seeing because we already have enough video footage for this year’s movie. I felt that the best site along the Bemo Ledge shore for lobsters would be Stone Garage, so I anchored there in about 25 feet of water. We could see large underwater boulders from the surface. It looked very clear. And clear it was. 40-50 feet of visibility, but the water temperature was 58 degrees on the surface. At the bottom, it was in the low 50s. There were salps and comb jellies in the first 15 feet of water. These are a sure sign of fall. We saw lots of big egg-bearing lobsters. There was a large school of striped bass up near the shallows. They circled me and my bubbles frightened them away again and again. I wonder why they kept coming back. I saw sheets of orange sheath tunicate that looked like tattered lace tablecloths hanging loosely over boulders. This must be its end stage. The sun was at a low angle aiming in towards shore so the rocks were bright against the dark background. It was easy to navigate in the clear water. We motored to Kettle Island for the second dive as the wind freshened from the southeast. It looked good at the southwest corner of Kettle. There were large flocks of birds swooping and dancing on the water very near the site. This is where fishermen set up a fish weir during the early spring. It must be a favorite of fish. They were gathering in groups today. Many were breaking the surface with the sides of their bodies and the gulls were squacking their excitement. As we entered the water, I could tell it was going to be a completely different experience from the first site. The water was dark and the visibility was only 5-10 feet. It seemed colder too. Pete said it was about 52 degrees at 40-50 feet where he and John were hunting. I followed several trails of dusty, silty tracks kicked up by the guys in front of me. There was a slight current on the surface and Pete said there was a large school of striped bass near the island. This could have been the source of the birds’ attention earlier. The ride home was warmer because of the soup Pete cooked for everyone. Well, it certainly WAS warmer than yesterday. Thank goodness it wasn’t wet hardly at all. But it was very breezy. We went north again heeding a forecast of “40 knots from the SW by 11 AM.” It never got that bad. 15-20 from the west, maybe. Not more. We tried going over the top of Halibut Point, but turned back to Calf Cove inside Folly Cove. I anchored outside it in about 25 feet of water. Kurt Brown and Peter worked on skills. Richard Brandolini went sight-seeing because he’d never been to Folly Cove before. Laurent went hunting. He’d noticed salps in the marina before we left, but didn’t see any in open water today. The water was 60 degrees on the surface and we flapped at anchor like a flag in slow motion as the breeze swung us back and forth. Pat Walsh was crew and her ear worked fine. 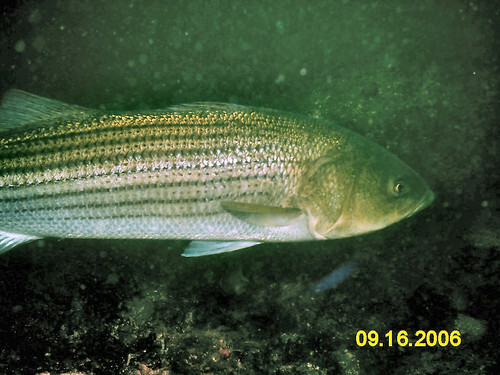 Laurent saw a school of striped bass along the wall. Richard and he both saw a huge lobster, but not many anemones were out. The second dive was just across the cove in 28 feet beside the restaurant called The Lobster Pool. This time, I got wet too. The water was warm enough on the surface, but in the low 50’s at 40 feet. The thermocline was at about 35 feet. I saw lots of lobsters walking around on the bottom, not hiding at all. I swam over to the wall and saw critters going about their Sunday afternoon business. The tide was high and everyone was snacking on something. We watched the sky cloud over and clear several times during the day, so the ride back down the river was a relief as the sun stayed out. It was actually hot. The weather person on channel 5 said this would be the last hot day of the season. We were expecting rain. However, the wind was from the south and that meant we could go north. During the morning’s drive-around with Dunkin and a corn muffin, we decided that Folly Cove looked best. As we were loading the boat, it started to drizzle. I got into my foul weather gear and drove from the upper station so as to give the passengers as much room as possible to stay warm in the cabin. Daybreaker was already at Folly Point as we pulled into the cove. He was almost done and left before our people got into the water. I anchored half way between the inner point and the outer point of the cove. Paul Savageau, Nan and Lilly Nutt, Curt Brown and Laurent Dubois were in the water quickly. It was 55 feet below the boat and the thermocline was at about 35 feet. Nan said it was warm enough in the first 35 feet, but got cold quickly after that. It was also dark and silty. She and her daughter stayed shallow for the rest of their dive. By this time, it was raining steadily. Paul found a lost weight-integrated pocket with 10 pounds in it. Since he uses that kind of system, it was treasure to him. Curt and Peter worked on skills at the back of the boat. Laurent went hunting. It was raining less. For the second dive, we decided to move to more favorable hunting grounds. I picked Lanesville Shores and a special site known to us as Johnny Mac Cove. This was the place where a student of ours finally “got it.” He had been struggling with the skills and here is where he put it all together successfully for the first time. It’s also a great place for lobstering. Everyone went in for a second dive because I cooked Ramen noodles with stewed tomatoes for soup to warm them up. It really helps to have a big steaming cup of hot soup to hold between dives. The wind was freshening and the rain had stopped by the time I got into my gear. Everyone else was off, excep The Captain and Peter who was still working with Curt off the stern. Pat Walsh was able to get in, get down, and come back up for her poker and bag. There were lobsters down there! Her ear worked for the upping and downing just fine. I noticed how different the water was at 40 feet (silty and dusty) from the water at 20 feet (15 foot of visibility and 60 degrees). It stayed above the rocks to keep in the clearest part of it. There was a school of stripers in the shallows as well as a very indifferent sea raven. I love being among the stripers because they are seasonal and we don’t have them with us all year. How effortlessly they move and how quickly they disperse when I exhale. The drive home was dry enough and the sky lightened as eight of us convened inside The Gull restaurant for cod cheeks (me) and strawberry shortcake (The Captain). Tomorrow is supposed to be warmer and wetter. Oh, joy. Cathy took this picture of a striper that circled her and Bill under the bow of Easy Diver last Saturday. She also made her 100th dive that day. The weather held. It was warm and almost windless again. We got fuel and then rounded the Dog Bar Breakwater to go north. Thacher Island looked good, so we anchored in the calmest water available which was on its north and west side. It was about 30 feet deep with visibility of about 10 feet and the water was 63 degrees. Veronica and Sara Grady saw several sculpins and sea ravens. Peter and Curt Brown began his scuba lessons. Laurent went hunting. Paul and Charlotte were shooting photos. Jim Castelli was just sight-seeing. Pat Walsh was also crew today and her ear is working great again. She’ll only be doing one dive a day on weekends until we leave for Andros in order to be cautious. I stayed topside to keep an eye on things and help anyone who needed it. The Captain shot video. Although the site was fine, the bottom was smoother and less rocky than the north east coast of the Island. I decided to look for more interestering terrain. The second dive was in a calm spot just inside Gap Head, over an old site of wreckage. Its big pipes hold cod and big cunner. Sara’s ear wouldn’t clear so she went snorkeling among the rocks to look for the 10 Most Wanted non-native species that divers are documenting. I had anchored the boat in 30 feet of water, but the site had a drop off that let some folks go deeper. Curt and Pete found a huge lobster that was too big to take. I videoed dripping patchs of orange sheath tunicates. The water was 62 degrees and the visibility was about 15 feet. We decided to go back the smoothest way, not the quickest. That meant circumnavigating the island. On the way home around Halibut Point, just off Folly Cove, Laurent spotted the flippy-floppy fin of a mola mola. Paul, Veronica, and Laurent hopped in with just bathing suits to get a closer look at it and perhaps to take its picture. Unfortunately, it took off for the depths when it sensed their presence. We had a day chock-a-block with fun and adventure. Today dawned MUCH better than expected. No wind to speak of. The ocean viewed from Magnolia was flattening out from hurricane passage. We decided to go north to be sure of the best possible visibility and conditions. The river was empty. No boats were out on our way up to Halibut Point. We anchored just over the top in Hoop Pole Cove in about 20 feet of water. It was 60 degrees on top and about 20 feet of visibility in the cove on the bottom. If you swam down the anchorline towards the mouth of the cove, it was murkier and surgier the deeper you got. Nevertheless, it was still 60 degrees on the bottom there too. Bill Low and I both saw a large black sea bass snuggled under a rock. It was a very tight fit for the fish, so we wondered what else was under there with him. Some food or maybe a lady friend? The rocks are covered with pink coraline algae, purple sea weeds, and mauve growth of some kind. It looks gorgeous. I even saw a purple crab that seemed to blend in perfectly. Larry Finer saw a huge egger near the anchor and she was plainly not worried by his presence. 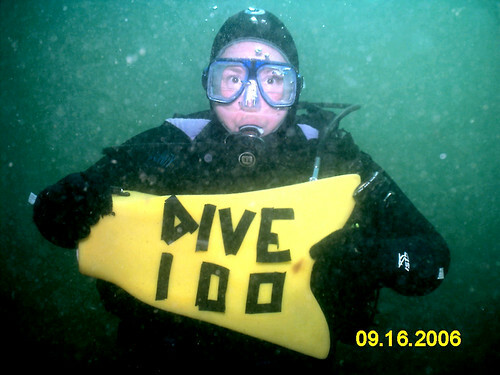 Cathy Myers made her 100th dive and Bill took her picture. I hope to be able to post it here later. Laurent Dubois and Pete were hunting. Pat was gingerly testing out her healed ear in the same spot where it was injured 8 weeks ago. It passed! We decided to go back around Halibut Point for the second dive. Maybe we’d find calmer water. We lucked out off the cemetery at Lanesville Shores. The water was 51 degrees at 60 feet, according to Laurent. It was 62 degrees on the surface. I made a second dive to about 25 feet and saw more pink rocks. There were lots of lobsters and the hunters were happy. Cathy and Bill Myers were surprised by a four foot long striper. Cathy said it charged her face several times and circled around them right under the bow of the boat. She hopes she got some pictures of it, but judging the distance as it was swimming by was going to be iffy. Two other dive boats were anchored nearby and we all bobbed gently in the non-wind, non-swells, non-current conditions. It was simply too good to be believed. Off to Dr. Butterfield’s for a soiree. Veronica said it. She and Pete were crew today. It was blowing out of the north so we went south. There were already two dive boats at Kettle Island, so we opted for Saddle Rock. I anchored across from the wall at the Coolidge Reservation on Goldsmith Point in Manchester in about 25 feet. The water was cooler than yesterday at 58 degrees. The visibility was marginal at about 5-8 feet. Pete and Jim Castelli both reported seeing lobsters walking around on the sandy bottom. That’s unusual. Bill Low, Jacquie Riley, Joe Finkhouse, Joe Barardy and Laurent Dubois were lobstering, sight-seeing, and snorkeling around the most scenic part of the site. Pete and Jacquie saw a red sea raven and lots of cunner. The hunters got some lobsters and were happy. We pulled anchor to find a second site with better conditions. No such luck. The choices were worse as we moved closer to the harbor. The north wind was now combining with waves coming in from the east to make for messy conditions. Maybe Hurricane Florence’s effects were approaching. We settled on Old House Cove as the best of the options. The wind was gusting and the waves from passing boats were hitting us broadside. That’s when Veronica assessed the situation with the title quote. She’d made two dives and we were sharing the snacks she’d brought while huddled down behind the wall of the flying bridge in the fleeting sunshine. The divers found a few lobsters here and visibility that was even worse. The surge had kicked up the bottom so that it was hard to find the critters. The water was still about 58 degrees. We were glad to get back to the dock where the sunshine seemed much warmer out of the wind. The tide was full, so schlepping up the gangway with all our dripping gear was easy beans. A hamburger at The Gull helped ease The Captain’s muscles and release the tension of bracing against the waves. The wind was very light from the southwest. We went north with newbees, Linda and Henry, who wanted to learn how to catch lobsters. Jim Castelli and Steve Gates also joined us. Kathy Cardinale and Peter Donahue were crew. We pulled into the point at Lanesville Shores, near the cemetery, in 25 feet of water. The water was 63 degrees with visibility of 6-8 feet. Pete said there were lots of lobsters. Jim and Pete both remarked that there were lots of cunners too. Pete noted most of the kelp fronds were broken off and gone, leaving only the stalks of about 1 foot. He also said that if anyone touched the bottom, it exploded in slit and dust. Linda and Henry were timid at first as Pete pulled lobsters out of holes and let them walk around. Nevertheless, they caught three keepers at this site. Steve got several too. Kathy got one also. The second dive was at Fisherman’s Canyon next to Cathedral Rocks in 22 feet of water. Again the water was 63 degrees, but the visibility in front of the boat was up to 15 feet. Pete saw lots of urchins, broken kelp stalks, and lobsters here. Steve caught a few and Linda and Henry were successful too. The Captain and Jim decided to try to find the mud at 80 feet and took off perpendicular to the anchored boat. They made it to 53 feet before deciding that the visibility was too poor to continue to look for the deeper bottom. We motored back to the mouth of the Annisquam in brilliant sun and a light breeze. A perfect day for diving. Strawberry shortcake at The Gull sure hit the spot. Morning dawned upon us with a prospect of hope. Was that the sun? Woohoo! Although it was still blowing, the direction was now from the west southwest. Too bumpy to go south, might be choppy going north. I know! Folly Cove! We boarded Jim Castelli and Trisha, Bill Low, Deb Greenhalgh, and Laurent Dubois for a trip to look for the calmest, clearest water I could find on the cape after three days of Hurricane Ernesto. We were also at the deadline for lobsters for Pete’s Labor Day Cookout. Talk about pressure. The first site was between the wall and Folly Point in 58′ of water. I sank to the bottom under the boat and raised a cloud of silty dust as I landed. The water was warm on the surface, 61 degrees, and cooler on the bottom, 51 degrees. Visibility was stirred up and only about 10 feet. Fish were everywhere and very friendly. I think they get used to divers breaking open sea urchins to feed them by this time of the year. They expect to be fed and hover in anticipation. Videoing anything would probably be a waste of electricity and effort, so I just cruised along and watched for critters. Saw divers from a sailboat trailing a long white line with a hook on the end. Maybe it had held their dive flag? Deb and I buddied for the second dive. We set the anchor in front of the restaurant across the cove from the wall. The depth was 35′ and the visibility was considerably better at about 15-20′. It was still 61 degrees on the surface. There were lots of red and white floats huddled against the breakwall that could have been from a net or from individual lobster pots tended by the restaurant workers. We planned to look for anemones for Deb and some shots of her with her video camera for me. We only found scarlet psoluses, but I got some great images of her with cunners hanging around the camera. Their fearlessness is fun to watch as they ooch closer and closer to the lens. Then she exhales and they all scatter. I hope she got some footage of their snouts with snaggly teeth looking in. The wind picked up as we surfaced and it was a bouncy ride back to the mouth of the Annisquam. Pete’s cookout was a feast, as usual. Cal and Chris ran from the rain to edit the movie they shot this summer. Walshie went off on her eating safari to the Vineyard. Laurent ran all the lines on the boat rather skillfully and I drove in a downpour. We all had our suits on. Better than football. The water was 61 degrees. The visibility was 6″ to 5′. The boat was anchored in 20 feet behind 10 Pound Island. As we jumped in, Bill Low saw a squid in about 18 feet of water. I saw flounders exploding off the bottom in a cloud of dusty silt when we came near, not even knowing they were there until they bolted. I saw lobsters on the mud huddled under kelp fronds that were constantly moving – frond and lobster together. There were also stands of green fleece alga in the shallows and beds of orange sheath tunicate on abandoned lobster pots. There were lots of abandoned pots. We came to the surface and saw raindrops landing in the ocean from the underside of the interface. The only boat we saw was the Coast Guard Zodiac on a call, blue lights flashing. Didn’t catch a single legal lobster although I gauged several shorts and let them go. Didn’t see any monster eggers. The cookout tomorrow will just have to be more hamburgs and hotdogs. Although Shaw’s IS open until 11.